True confession: I’ve become a fan of The Life-changing Magic of Tidying Up, a way to think about, honor, let go of, and/or enjoy the things in my house. Marie Kondo, the author, suggests we hold each object we own and only keep those that spark joy and for which we can find a storage place, going through the house by category (or sub-category) rather than by room. 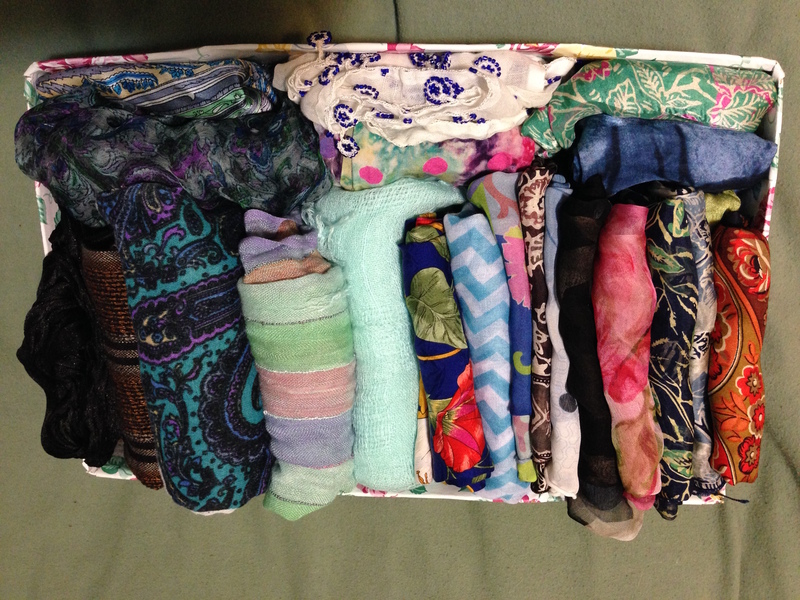 We begin with clothing, and are to fold clothes and stack them on end rather than in piles. She is Japanese, and from the Shinto tradition which holds that objects have feelings and fulfill a purpose, often one that is different from what we might first expect. What I find most astonishing about the process is that it is not so much about de-cluttering, which is how I have always approached letting go of stuff, but rather a way of honoring my things. By keeping only that which I truly like and storing it mindfully, I get a glimpse of how the house will look when I have finished tidying (in many months, I am sure). And I release everything else to fulfill its purpose elsewhere. This is certainly not for everyone. I have a friend who said that if she read the book she believes she’d have to create even more clutter. I just read about a study that shows that creative people are more creative when there is clutter to spark ideas (even if it does not spark joy!). 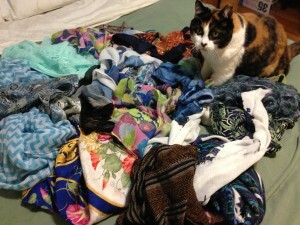 And it looks like Calico would have loved for me to leave the pile of scarves on the bed! 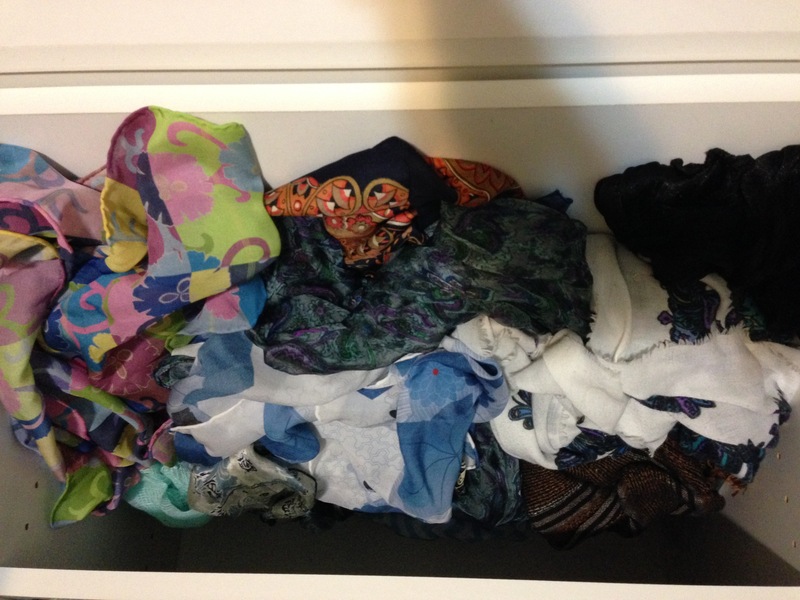 This entry was posted in Asia and tagged Fun, Habits, Serenity, Tidying. Bookmark the permalink. I think we are all creative to at least some degree. Sometimes we are afraid to let our creativity fly because we’ve been so criticized. 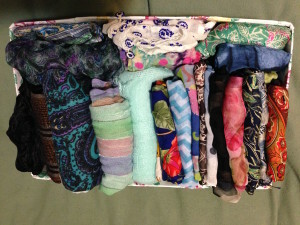 All of those (scarves except 2 small ones that I let go of) fit in the box. Amazing! You’re welcome! So glad you will be blogging again!